As today is Wednesday, March 20th, marks the equinox, which is the official start of Spring! After a cold winter, we’re itching to get out and enjoy the spring weather ahead. 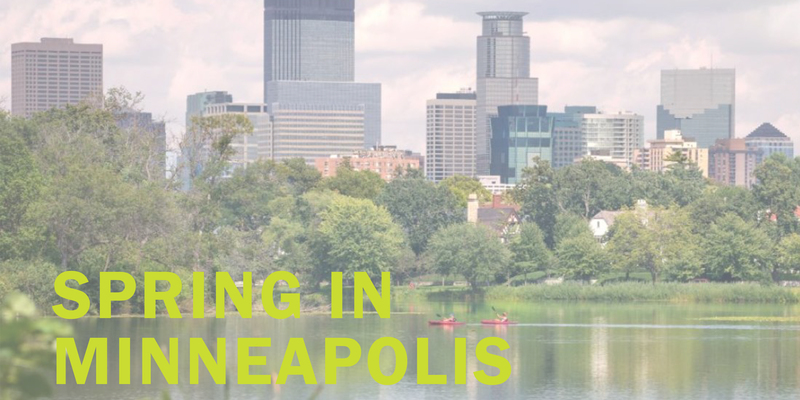 We wanted to take this opportunity to share some of our favorite springtime activities in the Twin Cities (Minneapolis/St. Paul area)! Did you know that Minnesota is the Land of 10,000 Lakes (11,842 to be exact)? All these lakes provide fun water activities for whatever your heart desires all around the greater Twin Cities area. Lake Nokomis, which is surprisingly near the airport, has paddleboard, kayak, and canoe rentals, as well as swimming and boat access. For those who prefer to enjoy the lake from the land, they have a full patio serving beer, wine and fun treats like kimchi-topped hot dogs and cheese curds. Not far from Lake Nokomis, is Minnehaha Falls. This urban waterfall is the centerpiece of a large city park that hosts picnic areas, trails, and sculptures. The strongest the falls will ever be in the spring, so make sure to get out to see them before summer hits. For the sports fanatics, the opening day for the Minnesota Twins (MLB team) is Thursday, March 28th against the Cleveland Indians. With over 81 home games this season, there are plenty of opportunities to enjoy a day at the ballpark. The Minnesota Craft Beer Festival features over 140 breweries pouring 400+ beers. The best part: Proceeds will be donated to Twin Cities Habitat for Humanity’s House that Beer Built. Who says a little fun can’t ? A though orginally geared towards the college community, Spring Jam™ is a celebration that brings the U of M and Twin Cities communities together for an over-the-top festival experience, including carnival rides, live music, and awesome food. General public tickets are available (as long as you’re 18+), so be on the lookout since ticket sales and lineup details are announced April 5th. To basketball fans, nothing screams spring louder than March Madness. Minneapolis is hosting the NCAA Men’s Final Four this year. While game times are TBA, the city is throwing a Final Four Fan Fest the entire weekend to celebrate. It’s a family-friendly event, offering a Home Run Derby, free cheer clinics, rock walls and autograph/photo opportunities. If getting yourself out there this spring includes job hunting, check out our open positions! We’re hiring in Minneapolis and all around the country!